Yorkshire Outdoors was established by Richard Fawcett, just over 25 years ago, we’ve got a passion for the place in which we live and work in, and the things we do show this tremendously well. Everything we offer is about quality, and offering a truly unique experience where customer satisfaction is absolutely paramount to us. As one of the foremost adventure experience providers in the UK, Yorkshire Outdoors is the perfect choice for your adventure. We offer our exceptional course which is set in 50 acres for you to challenge yourself in a 4×4 Land Rover for the ultimate experience. With the expert guidance of one of our trained team, get ready to have the time of your life! Whatever your experience level with our 1-1 tuition we’ll be here every step of the way. Richard is a force to be reckoned with! 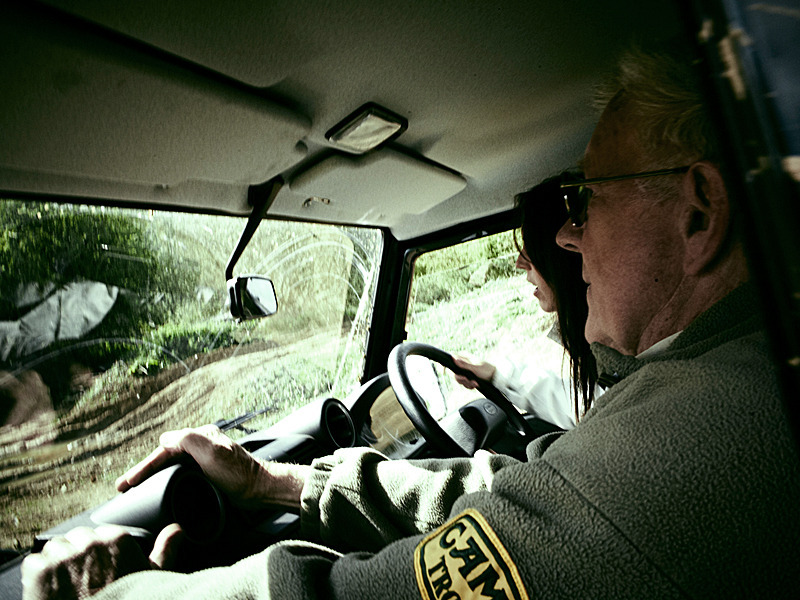 Passionate and highly experienced, with many years spent driving across magnificent Australian sand dunes, Richard is a proud holder of the coveted Land Rover Instructor Certificate 1991 and is also a 4x4 Competition Winner. 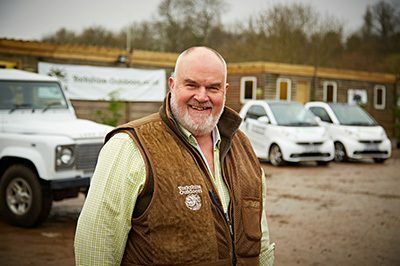 Vince joined the team after serving 24 yrs with the HM Forces as our Operations Manager & instructor, vastly experienced in 4x4, Quads & Segway’s tuition, Vince delivers his training in a fun & informative way ! 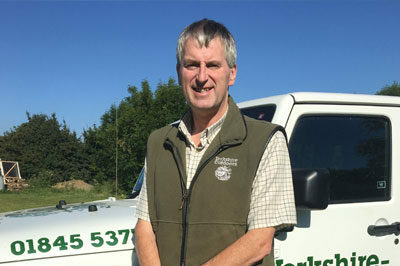 Brian joined the Yorkshire Outdoors team having years of experience in off road driving and clay pigeon shooting, his unique approach to everything he offers is quite like no other, specifically his off road driving, where he brings a certain new twist to it! All Brian's customers compliment him in our visitors book 'we don't know how much he's paying them!' If you're fortunate enough to have Brian - enjoy! Still going strong at over 80 years of age, Geoff's story is truly remarkable and an inspiration to us all. You can read all about Geoff by clicking the link below - it's well worth a read! Our 80 year old instructor has one heck of a story to tell! Some may think that our grandparents, when they turned eighty, were pretty active and fearless individuals who made the most out of life. However, if they had sent you a postcard one day saying that they’d bungee-jumped off the Sky Tower in New Zealand, flown a plane loop-the-loop, sat on a bomb, been shot at by soldiers, were running 4×4 training sessions, and had been deep-sea diving, sandboarding or having coffee with Saddam Hussein, I guess we would have been quite taken aback, to say the least. For Geoff Watkin’s family, though, it’s all part of the territory. Geoff’s take on life is simple: ‘You have to take the monotony off things, don’t you?’ He certainly practices what he preaches. 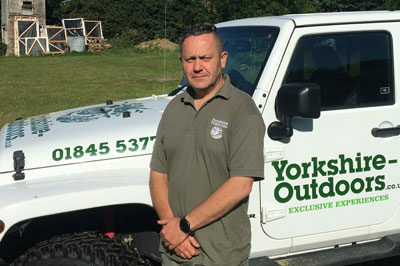 He is a valued member of staff here at Yorkshire Outdoors, giving off-road driving instruction to the groups and individuals who come along to the centre. Customers who visit us get a pretty good deal of it really. 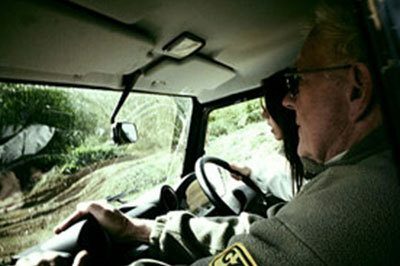 Not only do they get professional off-road driving training from someone who has worked for Land Rover for most of his life, but they get to listen to some pretty far-out stories, too. It’s not just that Geoff is a driving instructor who’s turned eighty, which we’re guessing probably makes him the oldest in the country but he has a zest for life that frankly, most of us half his age or less should be very envious of. Geoff reckons he was born with a mischievous streak, much to his mother’s distress, and this was a recurring theme throughout his childhood. Take, for example, the day a policeman brought him home for clambering down a hole on to an unexploded bomb because he ‘just wanted to see what a bomb looked like’. When his bewildered mother asked her six year-old son if he even understood what a bomb was capable of, he said (in a strong Brummie accent): ‘Yeah, Mum, I know what they do – blow stuff up!’ For a normal person, the anecdote might have ended there. But for Geoff, this fondness for explosives led to him becoming the ‘mascot’ for his father’s branch of the Home Guard bomb disposal squad, who took him along every time they had to detonate an unexploded bomb – so he could actually sit on it for good luck before they went to work on it! Somehow surviving his childhood in one piece, Geoff went on to train as a chippy in the family shopfitting business, although what he really wanted was to be a mechanic, building cars. He got started on his dream career by working for Land Rover, on a production line, as a line snagger, and he’d been there about three months when the job of foreman came up. Everyone was asked if they wanted the job, and no-one did, but when Geoff said that he’d like it, he was told that he hadn’t worked there long enough. This was the start of Geoff getting noticed at work, when he stood up to the bosses and told them how unfair their system was and that he felt like a child who’d been offered some sweets and then had them taken away! Gradually, he moved up in the company and learnt the other jobs in the place, volunteering for night duty and becoming the head man on his shift. The demo drivers whose job it was to show customers how the vehicles performed off-road would come in with beaten up Land Rovers, and Geoff started using second-hand bits and bobs to fix them with. This initiative, and his flair and enthusiasm, impressing the bosses – it was inevitable that here was an employee destined for an interesting career. 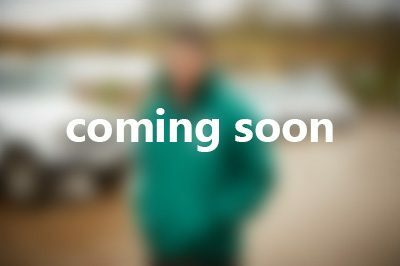 Just how interesting became apparent when a new job came up, which was billed as involving lots of travelling, off-roading and talking to people, getting employed as full-time staff during a time of strikes, and gaining more money and a motor to boot. Geoff jumped at the chance, along with 69 other people, and he got the job. This new job mainly involved demonstrating Land Rovers to people. Not your average people, mind – we’re talking princes in Saudi Arabia, armies in Iraq, Camel Trophy participants and important customers all over Europe. As you can imagine, Geoff has enough stories about these years of adventure to warrant a book. It wasn’t all rosy, either – working in war-torn countries definitely had its downside, such as being shot at in Lebanon. ‘I took it with a pinch of salt’, he shrugs, when describing a particularly hairy moment on the border involving a soldier, a rifle and a bullet whizzing past inches away from his head. ‘It was dangerous. You got to see a different side of things though, actually living out there. There wasn’t as much animosity between the Muslims and Christians as people would expect. The people I met just wanted to get along’. 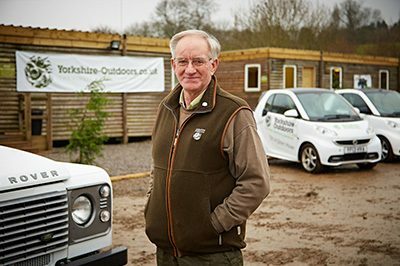 He retired from the job with Land Rover in 1991, when he helped Richard Fawcett to start up Yorkshire Outdoors, but 15 months later he was asked back. 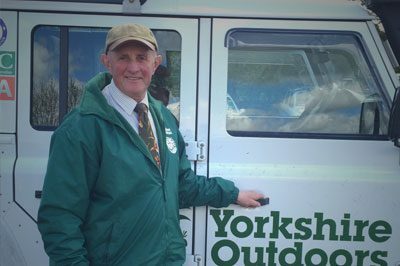 He officially retired about 8 years ago (yes, that’s at 75), after working as an independent consultant, and now enjoys his role at Yorkshire Outdoors, meeting new people and teaching them about driving off-road. ‘It’s in the blood’, he says. The team agree, and fully expect to see Geoff celebrating his 90th here; an idea that Geoff seems pretty happy about too. The view wasn’t too bad when he flew a plane loop-the-loop, either. He was given plenty of warning in advance that when you go into a loop in a plane, it can scramble and disorientate your head – he didn’t have any trouble with this though. ‘The G-force in your neck is horrific – but when that plane turned and fell, it was the most exhilarating feeling ever!’. They did a slow roll and he flew the plane himself, going through a thunderstorm with lightning at one point, where they couldn’t see anything at all out of the windscreen. ‘I didn’t mind’, he assured me. ‘Marg was a bit worried though.’ Scuba diving is yet another one of Geoff’s adventurous hobbies, but he does also find time for some slightly tamer activities too, such as caravanning and bird-watching in Scotland – a little more along the lines of your average eighty year-old, maybe. Gordon first visited us as a customer around 23 years ago and returned time and time again until he became so experienced that we just had to offer him a job! In losing our best customer we gained a truly fantastic instructor who is loved by all, never failing to raise a smile from his clients. - Ron, Alex and Ben Whisker. We all wish him continued improvement and eagerly waiting his return.